This time I went for something a little larger, as I'm getting very satisfied with the outcome of these breads using a 12 hour autolyse. I also added a little fennel for the aroma. Second time with this and once again, smelled of vinegar as dough in the morning and as baked bread. 12.0 oz Flour: Hard Red Wheat K.A.F. 10:00 Transfer bread, cover, place in oven. +30 minutes: Remove from Dutch Oven, leave in Oven. Week three and bread three. Last time, i felt the structure of the dough was lacking, so I did a few more stretch and folds before shaping. To facilitate fermentation, I also did some more folds early and slightly decreased the salt. In this i was certainly right, for the first time, the dough doubled in bulk overnight and proofed very well. 8.0 oz Flour: Hard Red Wheat K.A.F. 10:00 Transfer bread, put ice cube in with it, cover, place in oven. +35 minutes: Uncover. Reduce heat to 425 F.
Like the last, this had a great flavor. It rose well and sprung decently, shaping could have been tighter though. The extra five minutes covered seems to have helped firm the crust more, which was very crunchy once toasted. My second loaf on TFL. This time, with an increased bulk ferment, slightly decreased inoculation, and, taking the advice of Alison Kay, increased salt. Friday ~19:30 Feed Starter 0.3 oz Water and Flour each. 9:40 Transfer bread, seam side down into D.O.. Score, put ice cube in with it, cover, place in oven. +30 minutes: Uncover. Reduce heat to 425 F.
This came out much nicer than the last. Sour aroma was very present from uncovering the dough to baking to baked loaf. That came through as flavor too, and will likely strengthen. 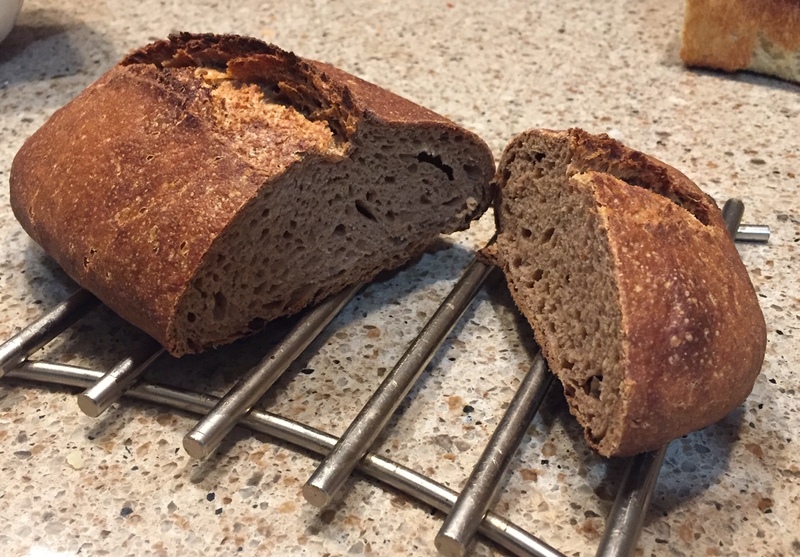 The crust was hard and crisp, crumb fairly open, but a bit gummy. May need more proofing and shaping. To all of you unsure how long dough can be left at room temp., 2 consecutive 12 hour cycles and 3 hours being worked did not hurt the bread.